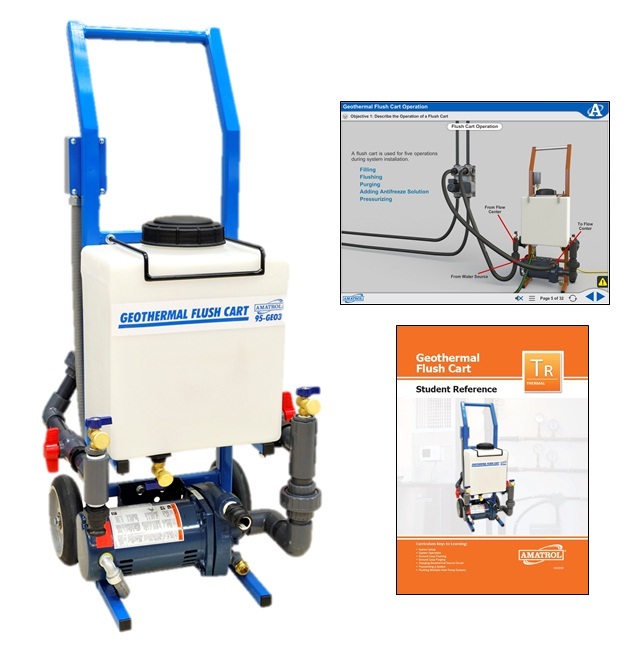 Amatrol’s Geothermal Flush Cart Learning System (95-GEO3) teaches how to purge debris and air from the geothermal loop and then charge it with a glycol/water solution. Dirt and plastic pipe shavings can become trapped in geothermal systems during construction and must be purged to avoid damaging the system during operation. Proper procedures for filling and pressurizing the system must be followed to avoid aerating the fluid being used to charge the system or this entrained air will lower system performance. The Flush Cart training system, which includes a mobile cart and a pump system, will cover flush cart set-up and operation to teach how to flush, purge, charge, and pressurize the geothermal system. It also covers introducing an anti-freeze additive to prevent pipes from freezing. This hands-on green energy training solution also includes Amatrol’s world-class, highly interactive multimedia that will help learners to gain insight into the theoretical aspects of how the flush cart works and then allows them to follow along with step-by-step explanations of hands-on skills.